"Community Festivals are often the centerpiece of the summer for cities and towns across America. In Middleburg Heights, Ohio, the ‘Summer in the City’ festival is just that, a centerpiece of community collaboration, cooperation and pride. 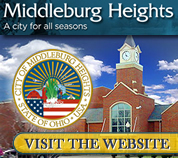 On behalf of the administration of the City of Middleburg Heights, we thank the tens of thousands of people who flocked to Southland Shopping Center for the Middleburg Heights 'Summer in the City' community festival each year." Community Festivals are often the centerpiece of the summer for cities and towns across America. In Middleburg Heights, Ohio, the ‘Summer in the City’ festival is just that, a centerpiece of community collaboration, cooperation and pride. In 2007, the founding members of the City Club of Middleburg Heights, including Anthony Crea, Charles Bichara, and Jeff Minch presented their vision for a grand new community celebration. In the past, the Middleburg Heights annual Home Days Celebration was a quaint summer gathering on the City Hall grounds that attracted a thousand or so visitors. The City Club, with a mission of bringing together businesses, residents and civic groups in a community celebration to foster an appreciation of everything that Middleburg Heights has to offer, organized the first ‘Summer in the City’ festival. 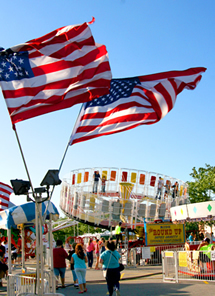 In 2008 more than 20,000 visitors walked the one-thousand foot long midway on Smith Road in Southland Shopping Center to enjoy live music, great food, rides, games, and the opportunity to share time with friends and neighbors. The event also served as the community grand opening of the new 87,000 square-foot Giant Eagle store which anchored the $14 million dollar redevelopment of Southland Shopping Center. In 2009 more than 25,000 people enjoyed ‘Summer in the City.’ Led by Charles Bichara, the Summer in the City Sponsorship Chairman, over twenty sponsors stepped up to continue the ‘Summer in the City’ community festival. The planning, operations and logistics of the event were expertly coordinated by the City Club of Middleburg Heights. The City Club worked with the City administration and City Council to get the entire community involved. The end result was a community gathering that celebrated one of the most successful and respected suburbs in the Cleveland and Northeast Ohio region: Middleburg Heights! Middleburg Heights Summer in the City Festival Parade Community response to the event was, and continues to be, overwhelmingly positive and a source of civic pride. Over the past ten years, the festival draws over 26,000 attendees each year. 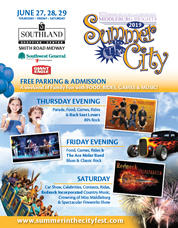 After moving the annual community celebration to the site of the new Middleburg Heights Library in 2018, the Summer in the City festival will return to Southland Shopping Center in 2019 on June 27th, 28th and 29th by popular demand. 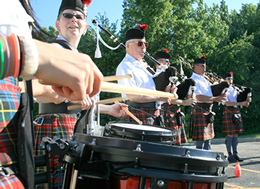 Visitors from Middleburg Heights and surrounding Northeast Ohio communities will attend the event to enjoy the largest parade in Middleburg Heights history, live music from top bands, games, fantastic amusement rides, entertaining contests, a classic car show, and a spectacular fireworks show. 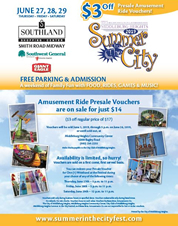 In 2019, Summer in the City will feature more concerts from top entertainers, more rides and events, and special attractions not found at any other community event in Northeast Ohio. The midway for the festival will, once again, be a 1,000-foot section Smith Road which bisects Southland Shopping Center.